Candlemas, welcomes the young sun god’s embraces and conceives a child. Solstice. And so the cycle closes at last. glance at Nature will prove. even if the conception was a bit unorthodox. theme occurs in M. Esther Harding’s book, ‘Woman’s Mysteries’. The other Christian holiday which gets mixed up in this is Easter. darkness (death), so it makes sense to place it at this season. 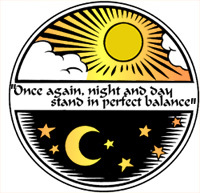 traditions began referring to the Vernal Equinox as Eostara. is best reserved to the nearest Esbat, rather than the Sabbat itself. mythologists refer to it by a common phrase, ‘the harrowing of hell’. Spring, returns from the Underworld with her gift of abundant life. storytelling, reading, or dramatic re-enactment. enters the astrological sign of Aries. Revised: Saturday, May 23, 1998 c.e.